It took me a bit of time to review The Benefit POREfessional Matte Rescue because everyone who reads my blog knew how much of a normal/dry skin I have! So I had to really wait for the chance to apply this on clients, and myself! As my T-zone does get oily especially with this crazy weather on random days! After months of testing, I'm finally ready to review how effective or not-effective this product is. The newest from POREfessional line, the Matte Rescue Super mattifying Gel. 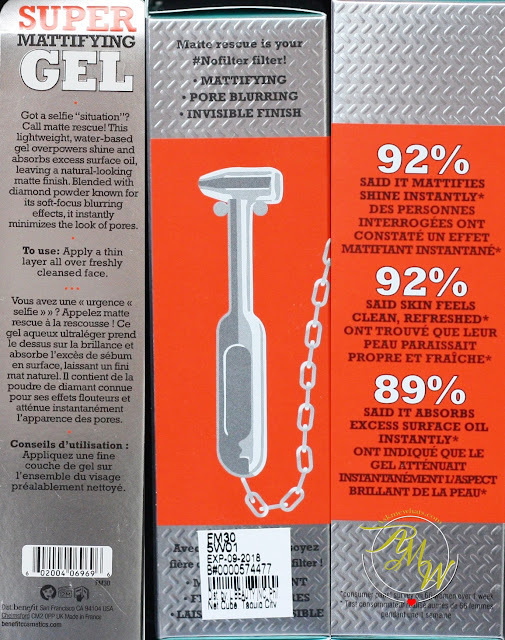 Thankfully, this product is an "invisible-finish mattifying gel". With this crazy weather, who needs to add anything on the face that gives color? Not me! There are days I just want to zoom out of the door without wearing any makeup at all! Just to prevent any possibility of makeup meltdown! Gel-like texture so it never feels heavy on skin. Has a nice light floral scent. Surprisingly effective even on normal skin! Oil-control may not hold for the whole day for users with extremely oily skin! A wonderful addition to your "kit" when you want to prolong the oil-control to around 2-3 hours (depending on how oily your skin is). Lightweight, refreshing gel that smells awesome! Best to use this under POREfessional balm. I find using both together works better! No need to apply all over face! Apply only on areas that tend to oil up like T-zone or chin. A bit bigger of a pea size is the right amount for the whole T-zone. Can be applied alone or as primer. Best use with clean fingers. Not for myself but for my professional kit. A great touch-up tool for clients. Those who wanted to minimize retouch. Best for oily and combination skin. Available at Benefit counters near you (Greenbelt 5, Rustans Makati, SM MOA, Shangri-La Mall, TriNoma, Central Square BGC, SM Megamall and ATC priced at Php1,600.00. Super nice packaging! I feel so "rich" every time I pull this out! Sealed upon purchase! It has to be sealed for freshness, do not get it if the seal is broken! The gel comes with a light bluish tint but it disappears after massaging the product on skin. I am definitely targeting to use this hand-in-hand with the POREfessional BALM! It works better that way! Do you think you need Matte Rescue in your life? I probably need this but not for the whole face. Though I am wary about using products like this coz sometimes they make the skin even oilier in the long run. But that's just me. I have weird skin.